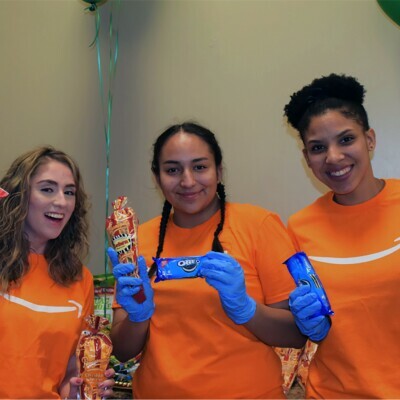 Amazon Fulfillment has long been committed to giving back to the communities where our employees live and work. 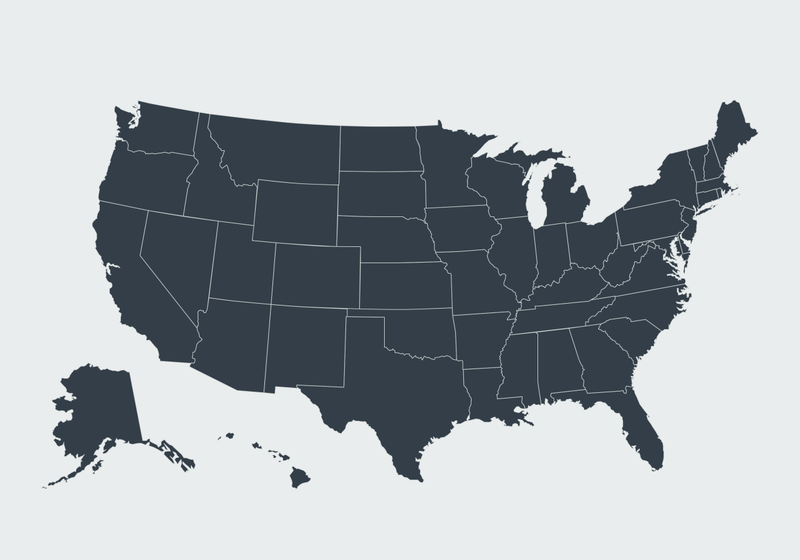 We make contributions to the community in many ways – through hundreds of local and national grants made every year across North America, through thousands of employee volunteer hours and through the donation of products from our inventory to local nonprofits. Amazon Fulfillment’s primary giving is focused on our neighbors in immediate need, particularly families fighting homelessness and hunger. We are also focused on providing resources to the next generation of innovators and helping ignite in them a lifelong passion for science, technology, engineering and math (STEM). Lastly, we listen to our fulfillment employees’ suggestions for local causes near and dear to their hearts and give to organizations in their local communities that have impact. PHX7 donated more than forty 10x10 pop-up tents to the Phoenix Police Foundation to provide the police department with critical cover to be used year-round at community events and investigative scenes. On April 21, Phoenix-area Amazonians hosted a military letter-writing campaign at Pat’s Run, the signature fundraising event of the Pat Tillman Foundation, which provides academic scholarships to active-duty service members, veterans, and their spouses. More than 330 letters were collected and will be included in care packages sent by the non-profit "Packages From Home" to active duty servicemen and women around the world. Additionally, nearly 200 Amazonians supported the run by either participating in the 4.2 mile race on Amazon’s team or volunteered to pass out water at an aid station along the race course. To celebrate Read Across America week, 50 associates from PHX3, PHX5, PHX6, PHX7, and TUS1 volunteered their time to read at three nearby elementary schools during the last week of February, reading to more than 800 pre-K through second grade students. PHX6 hosted Camp Amazon for nearly 40 sixth and seventh graders from Gila Crossing Community School, a school on the Gila River Indian Reservation. During the 4-hour STEM immersion experience, campers toured PHX6 and participated in a simulated truck packing challenge. Campers got an up-close view of PHX6's robotic arm in action. Then, with the help of students from Cesar Chavez High School’s Native American Code Writers Program, students had the chance to operate model robotic arms in a team table challenge. 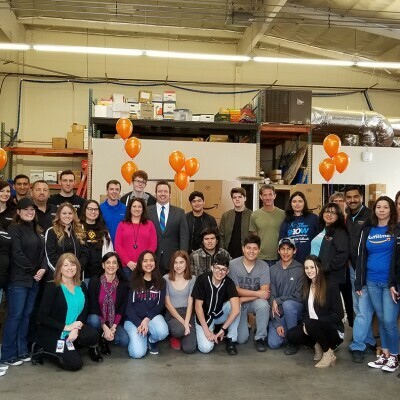 Following the activities, Amazon surprised Cesar Chavez High School with a $5,000 donation to continue funding their Computer Science program and support STEM education in the Phoenix area. Amazon made a surprise donation of $10,000 to UMOM New Day Centers, an emergency homeless shelter for families in Phoenix. Amazon also donated more than 1,000 new pairs of shoes to match the more than 1,000 pairs of new socks collected by PHX3 and PHX6 associates in a friendly "Battle of the Buildings" sock drive. 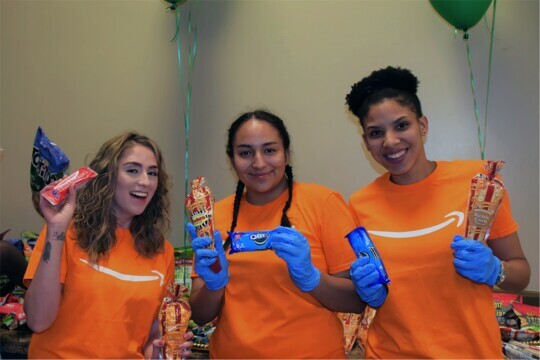 After the donation, Amazon hosted dozens of families living in UMOM’s emergency shelter for a “Twilight Movie Night” screening of the Amazon Original Kids Series “Lost In Oz” and served snacks donated by the Phoenix Prime Now team. More than 20 associates from PHX3, PHX6 and Prime Now volunteered to support the event, with five associates helping to serve the dinner meal to families that evening. PHX6 Facilities Manager Clinton Chadwick participated in a live STEM education webcast for students in Maricopa County’s 58 school districts. The event featured a pre-recorded tour of PHX6 and interview with Clinton about his career in engineering, followed by a live webcast to answer students’ questions in real-time through an online chat room. More than 75 classrooms watched the event live (2,000+ students). Following the webcast, teachers received a link to the entire video along with a “Solve It” activity to integrate into their lesson plans challenging students to design a better lunchroom distribution process. The curriculum includes videos for both students and teachers, and information on engineering design processes. Amazon Fulfillment Center MOB5 donated $10,000 to Mobile JROTC to support their summer STEM camp so that their cadets are inspired to pursue a career in science and technology. Associates and managers from Amazon’s OAK4 fulfillment center in Tracy, CA, participated in the 27th Annual Rotary Read-In, an event sponsored by the local Rotary Club in Stockton promoting literacy among children in the community. Volunteers spent the morning reading books and engaging with children in grades K-3 at Creekside Elementary School. The OAK4 team donated books to the school library, at the end of the event. Associates from OAK4 in Tracy, CA showed their support for the local Police Activities League (Tracy PAL) by running in the 2nd Annual Donut Dash at Thoming Park. Proceeds from this event will support the numerous programs Tracy PAL supports to create opportunities for the local youth to interact with police officers in positive learning environments. This year welcomed more than 600 participants to the event. 9 managers and associates from Amazon’s Sacramento fulfillment center, SMF1, volunteered their time for the H@ck the Park Festival at North Laguna Creek Park in Sacramento, CA. 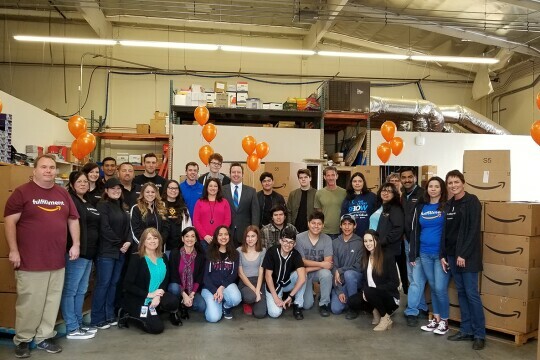 The event impacted hundreds of local students and reinforced Amazon as a strong community partner committed to advancing access and innovation in the lives of local students. Local STEM-based nonprofit Square Root Academy hosted the event, a “tech wonderland” intended for all ages to learn and experience different types of STEM activities through a variety of interactive booths. The oobleck hopscotch booth was the most visited and enjoyed activity by all visitors during the festival. Leaders from Amazon’s San Bernardino and Moreno Valley fulfillment centers delivered something unique to Feeding America of Riverside and San Bernardino Counties. Instead of the iconic brown boxes with a smile, Amazon visited the food bank to deliver insights and expertise on streamlining operations to maximize resources and improve overall efficiencies for the nonprofit. More than 120 local students between the ages of 11 and 14, spent their day at Camp Amazon, a free robotics and STEM (science, technology, engineering, and math) immersion experience at Amazon’s Patterson fulfillment center. Each activity at Camp Amazon was designed to engage students in a different aspect of the technology and engineering that drives an Amazon distribution facility, from robotics to package distribution and logistics. With the help of the San Joaquin and Stanislaus Counties of Education STEM departments and Amazon fulfillment center staff, campers assembled model robots, took a tour of the fulfillment center, and tested their STEM knowledge with hands-on activities. Students also toured Amazon’s state-of-the-art distribution facility and took part in a series of hands-on learning activities. Amazon’s Tracy, CA fulfillment centers OAK4 and SJC7 teamed up to support a local food bank raise money to fight hunger. More than 30 associates and managers participated in the 5K fun run which began and ended at River Islands Technology Academy in Lathrop, CA. Some ran in full animal themed onesies while others represented Amazon by wearing our most recent peak shirt. Smiles delivered at Redlands Unified School District. Smiles delivered at South West Park Elementary School. Smiles delivered at Big Brothers Big Sisters San Bernardino County. More than 10 managers and HR team members, including General Manager Monica Ravi and Assistant General Manager Andre Almeida, volunteered to support the mock interview portion of the Hire Me First program. Of the more than 1200 students enrolled, over 700 received one-on-one interviews and feedback during events coordinated at their respective High Schools in Tracy, CA. In support of National Robotics week, OAK4 hosted 27 local high school students on a robotics-focused tour of the fulfillment center. The students, most active in the local VEX robotics league, are also enrolled in West High’s Space and Engineering Academy, which prepares students for college studies and careers in STEM fields. Poquonock and Ellsworth ES: Amazon hosted two giving events which coincided with Dr. Seuss Day, encouraging children to read as well as to Learn and Be Curious with more than $15,000 in STEM toys and grants. The donation helped launch special mobile maker spaces at the schools which help bring STEM education to classrooms. Associates at our Baltimore fulfillment center volunteered to fill backpacks with a donation of more than $8,000 in STEM, writing supplies, books, and workbooks which were given to 330 St. Vincent de Paul Head Start children at six graduation ceremonies around the city. Each child received a diploma and a backpack filled with items to help them Learn and Be Curious during summer months, a time when learning loss tends to increase. In January, recognizing an immediate need for new, warm winter coats, Amazon’s Baltimore (BWI2) fulfillment team visited Mathew A. Henson Elementary School with a surprise gift of 500 new coats, one for every child. Over the course of several hours, associate volunteers greeted classrooms and helped each child select a new winter coat. Amazon’s Florence, NJ, fulfillment team surprised and delighted students at Roebling Elementary School with an event to celebrate the launch of our Rise & Smile breakfast grant which increases access to a healthy breakfast for all students at the school. We visited classrooms with engaging breakfast trivia games and prizes and then attended all four student lunches with our iconic banana cart, free bananas, raffle prizes and associate volunteers dressed as Banistas. Two of Amazon’s Columbus fulfillment centers came together for a fun, engaging celebration of the launch of our Rise & Smile grant at The Graham School, a charter high school in Columbus. Nonprofit Local Matters provided students with an interactive breakfast demo followed by Amazon-led trivia contests and prizes such as Fire tablets and Amazon gift cards. Touched by a personal letter from a local Special Olympics athlete, Amazon’s Etna fulfillment team gave Garrett Ford, his family, coach and members of the Special Olympics Ohio leadership team a tour of operations followed by a surprise donation to help cover Garrett’s travel to Seattle to compete in the U.S. Special Olympics Games. Garrett learned how associates and Amazon robotics work together to pick, pack, and ship customer orders all over the world. As a follow up to our Columbus-area FC tour and donation to a Special Olympics athlete, Garrett Ford, Amazon toured Garrett, his family and members of the Special Olympics Ohio leadership team through our Seattle HQ with visits to The Spheres, Amazon GO, and our iconic Banana Stand. Following the tour, Garrett competed in the U.S. Special Olympics which Amazon helped sponsor. Garrett won gold medals in his competitions and it was announced that he will go on to compete in Abu Dhabi at the World Special Olympics next year. Smiles delivered to Renaissance Jax. Smiles delivered to Barbara Hawkins Elementary School. Amazonians surprised Osceola STEM Charter School with $10,000 in STEM supplies, including a 3D printer, drones, and LEGO kits. Hosted 80 students from John E. Ford Middle School for a half-day immersion camp for students to learn more behind the science and innovation on how Amazon picks, packs, and ships customer packages. The students built their own robots and received 5 EV3 robotic kits to create their own program. Amazon surprised Trainer Middle School in Reno, Nevada, with a special delivery - $10,000 in STEM products and educational items to enhance the school's STEM makerspace plus $5,000 in funding to continue fueling the program. Housed in the school's library, the makerspace area gives students the opportunity to create, explore, and learn to encourage the next generation of innovators. More than 30 sixth graders were chosen by their teachers to participate in the event as reward for their academic performance. Following remarks by RNO4 GM Ron Buckley, the students were invited to dive into nearly a dozen Amazon boxes to discover the STEM items hiding inside. Among the donated items were coding robots, a 3D printer, circuit kits, virtual reality goggles and LEGO building sets. Amazon hosted a field day with the Chester YMCA for more than 100 children during Camp Feather's Jurassic World Week. Team members from PSC1 hosted a banana bonanza at Kennewick High School as part of Amazon’s Rise and Smile campaign to end childhood hunger. PSC1 site leader, Jeff Perry and PSC1 team members asked trivia questions and handed out giveaway items to students. More than 200 students participated in the event. Jeff Perry wrapped up the event by stating “We (Amazon) are members of this community, our families live and work here, and so we want to do everything we can to support the kids. That includes making sure they are fueled and ready to learn every single day." Smiles delivered at Intel Dupont community garden. Smiles delivered at Kent food bank & emergency services. Amazon supported the Employment Skills Center’s Buck a Book Literacy Program in Carlisle, PA with a donation of 13 kindles. The devices were awarded to 13 children K-5th grade who read the most books, raising more than $300 each to support adult literacy in the local community. Amazonians from several Central PA fulfillment centers convened at a pet shelter in Easton for a donation event and day of volunteering with activities like walking dogs, planting flowers, and unwrapping more pallets of donated items. The donation included a presentation of more than $10,000 in grants and 25 pallets of pet-related products to three area pet shelters in a celebratory event focused on Amazon’s spirit of volunteerism and local community partnership. A first-ever Battle of the Buildings, five Amazon fulfillment centers in Central PA held a friendly competition to see which building could donate the most Play-Doh to Caitlin’s Smiles, a Harrisburg-based nonprofit that kits and delivers Smile Bags with toys and craft supplies to children in hospitals around the region. More than 70 Amazonians from 5 Central PA fulfillment centers came to the nonprofit for a special giving event and day of volunteering. Thousands of Smile bags were filled with the 12,000 tubes of Play-Doh collected by the buildings as well as an additional $10,000 worth of toys, craft supplies and other fun activities for children. Smiles delivered to Spring Shadows Elementary. Donated $10,000 worth of STEM supplies to enhance hands-on classroom learning experiences and allow the school to create STEM backpacks that students can "check out" to continue their learning at home. Amazon surprised Partnership for Families, Children & Adults with hundreds of items including bed linens, toiletries, toys, and more to support local individuals and families in need. Smiles delivered to West Jackson Elementary.